When BB&T exam ined how it could increase its community impact in the Charlotte region, local executives decided the answer lay in leadership. 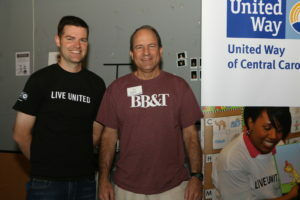 So when they launched their United Way campaign last fall, BB&T brought together an audience of 400 managers. After an introduction by Wes Beckner, BB&T’s regional president and United Way’s 2016 campaign chair, BB&T CEO Kelly King shared his perspective on leading with passion, and United Way executive director Sean Garrett discussed the impact of BB&T’s leadership giving through United Way. The audience heard about that impact firsthand from one of their colleagues, Fletcher Knox, who was supported by United Way’s financial stability funding in a Goodwill job training program for individuals with disabilities – a program that has led to his 20-year career with BB&T. 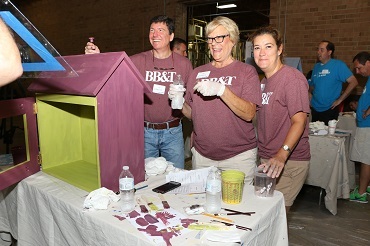 BB&T then unveiled an increased corporate commitment to leading by example, with a $50,000 matching grant for any employee who became a leadership level donor ($1,000 and up). The result: BB&T nearly doubled its number of leadership donors on the way to a 59 percent increase in overall United Way giving last year. Such leadership is what paved the way for BB&T to recently receive the Spirit of North Carolina Award in the financial institutions category (1501-2000 employees). See more on Facebook and Twitter.